Now Mandatory Reading in Police Academies, FTO Programs, and Universities! The NUMBER ONE Law Enforcement Philosophy Series. Written by Full-Time Police Detective, and Author Bernard Schaffer, whose new hardback novel THE THIEF OF ALL LIGHT will be available from Kensington Publications in bookstores everywhere. This is a must listen for anyone in law enforcement, but will also delight listeners who are fans of thrillers, mysteries, and true crime. As a former cop, this book gives an honest look at American law enforcement. 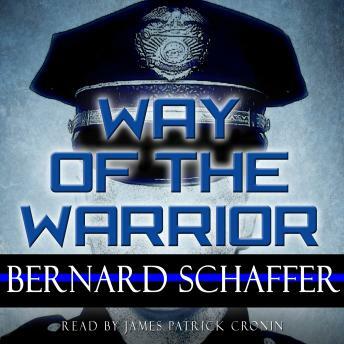 The book The Way of the Warrior: The Philosophy of Law Enforcement by Bernard Schaffer is a teaching biography. It’s an articulate no-nonsense account of one’s journey into the police fraternity and advice on what that can and in Schaffer’s opinion should mean. I want to make clear I have no personal ties to law enforcement, the military, or any profession that might have ever used a gun. However, I have a deep appreciation for an honest story, well told and this is definitely one of those. While James Patrick Cronin was an excellent choice to voice this book, I immediately thought of The Way of the Warrior as the combination of 1) excellent and expert instruction from the bestseller What Every BODY Is Saying: An Ex-FBI Agent’s Guide to Speed-Reading People. I also heard in The Way of the Warrior, 2) the often brutally honest storytelling and vivid descriptions from The Bitter Taste of Dying: A Memoir by Jason Smith, a man working very hard to get away from the law. Expert knowledge and excellent story. Schaffer doesn’t waste time reminiscing about his childhood but includes enough backstory to give us perspective. With over twenty years of experience and a father with another 30 years, the author is more than expert in what it is to be part of a police organization. If someone were to ask, “can someone explain what is happening with the police recently,” it’s Bernard Schaffer. While some of the reviews and blurbs mark it as required reading for police training programs, this wisdom reaches much further and to a general audience. Whether someone is starting in any career, it’s important to keep out of politics and to focus on finding the mentors you need while enjoying becoming exceptional in a specialty. The “Warrior” title leads to an easy misconception that being a warrior is about fighting, but this book is about keeping the peace in oneself, in one’s department, and keeping one’s honor to the profession through pride in one’s craft. The police dramas on television do the profession a disservice because they make it seem like each day is one filled with the excitement that keeps an officer prepared at all times. However, there is often tedium that might make an officer leave their bulletproof vest off their body. The routine might lead to forgoing regular practice for when a situation comes that makes clear the officer has not readied for it. Schaffer provides two excellent examples with the illogic of keeping one’s knife on the same side as the holster and another with actually trying to pull a trigger with bulky gloves. “Adapt. Improvise. Overcome,” he writes. The book made me remember every instance I met a police officer, good and bad, but I want to share one. In a traffic class I was in for going through a stop sign at least a decade ago, I remember the instructor’s words vividly. “Do you know those people who go through red lights, cut you off without a blinker, and speed through school zones?” “Yes, we said” “Doesn’t that annoy you?” “Yes, absolutely.” “Well, you are those people.” Who knows, maybe Bernard Schaffer was that instructor? Few books get it right like this one did. It’s honest in the writing voice with a depth of know-how that makes it a definite must listen. Don’t be put off by the word “philosophy” in the title, it’s not Plato or Aristotle giving some difficult to understand lecture. It’s a really, really smart guy putting in plain English that sometimes people do dumb things and sometimes officers do as well, but here’s why all that happens. It’s street wisdom for the masses.